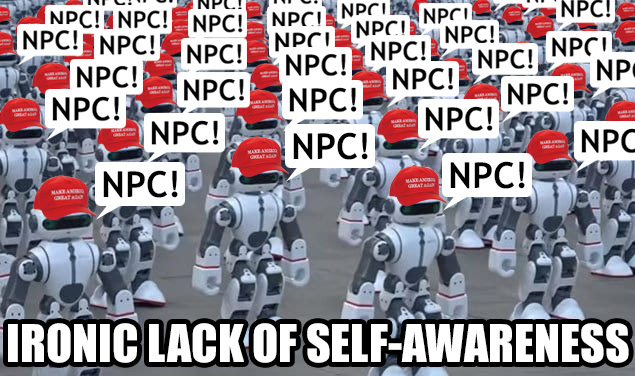 NPCs also look, and act, alike - indistinguishable from Hillarys audience. Aww cute, a npc meme from the left. I bet some nice old ladies grandson helped her make that. Not one liberal will admit that she shouldn’t have said it. She was clearly making a facetious reference to a racist trope. That doesn't make a person a racist and it certainly doesn't somehow make some other person not racist. I was hoping for a coherent answer from the deranged Libs on why she gets a pass on this. And we get the double talk like I knew we would. Facetious or not, it is still racist. Rosanne Barr - Bad taste racist joke.....loses her sitcom. Megyn Kelly - Comment about “blackface” Halloween costume.....loses her job. Racism in any form is still racism. Why does she get a pass on this? And where and when the # has Trump made any comments like that? Clearly she was and always was an unhinged uncivil Democrat that can't stand losing. She shouldn't have said it. She shouldn't be speaking in public. She shouldn't even consider a run for President. Hillary is right, all those hot suace chugging superpredators look alike. Those are all her words, so dont get mad at me. What bothers me is that the Democratic party is just dumb enough to try it. Personally, I'm hoping for someone under the age of 55. I'm long past the point of looking to 80-somethings for any kind of "leadership."